How to avail Sun Name Ur Number SIM offer? Once prepaid SIM is inserted it will prompted to the Name UR Number SIM screen and instructions will be given on how to select you preferred personal 6 digit number. Once desired number is available, you will receive a confirmation SMS. Note that numbers start with 0943-8xx-xxxx, 0943-9xx-xxxx, 0942-8xx-xxxx. On top of this feature, Sun Name Ur Number SIM also comes with a Sun Call and Text Combo 50 load which is valid for 5 days (comes with 200 Sun texts, 200 texts to other networks and 70 minutes of Sun calls), all for only P59. 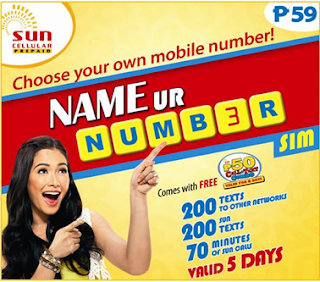 Sun Postpaid subscribers may also request their own special custom mobile numbers. A one-time charge fee depending on the Vanity number category is needed. Change to a vanity number may only be completed via the Sun Shop. Along with the network’s reliable connection, wider network coverage and a variety of prepaid products that cater to every budget need and lifestyle, now clearly is the best time to be with Sun Prepaid. It's a trend now that subscribers and consumers has the power to choose and customized everything according to their demand. Sun Cellular hits another innovation where other telcos are expected to follow. Sun Cellular which is now under the arm of PLDT Group continue to develop it's products and services for it's loyal subscribers. Learn more about Sun Cellular promos and services here.